Robert Lyman is an Ottawa energy policy consultant who was a public servant for 27 years and a diplomat for 10 years prior to that. He is s frequent contributor to Friends of Science Society. Years ago, environmental policy in Canada was concerned primarily with protection or enhancement of nature through the regulation of activities that polluted air, land and water, especially where this had a significant impact on human health. This included requiring environmental assessment and review of major projects to ensure, before government permits were issued, that the agencies issuing the permits had taken fully into account the potential effects on local environmental quality and human health. That changed when governments began to focus on the claim that human emissions of greenhouse gases (GHGs), central to the operation of modern economies, could have catastrophic future effects on the global climate. The adoption of aspirational international greenhouse gas emission targets as national policy moved the avoidance of global environmental effects to the centre of the national environmental policy agenda. Today, there are dozens of environmental non-governmental organizations (ENGOs) that operate on both the traditional program activities related to protecting nature and avoiding local pollution and the more recent promotion of GHG emission reduction. To reduce GHG emissions, they seek a fundamental transformation of the Canadian economy away from reliance on fossil fuels. Most of these organizations have charity status under the Income Tax Act, and are regulated as such by the Canada Revenue Agency (CRA). ENGOs must submit annual reports on their activities and finances. These reports are made public, and thus offer very useful, although not comprehensive, information to the Canadian public about how ENGOs with charity status operate. The purpose of this article is to summarize the results of a survey of the information contained in the annual reports to the CRA by the 40 largest ENGOs, and to compare this with other organizations that also seek to influence environmental policies in Canada. Table 1 is a list of the largest ENGOs in Canada, ranked according to the revenues that they have received over the period 2000 to 2018. They include a wide variety of organizations ranging from some that are quasi-governmental in nature, such as the International Development Research Centre (IDRC), to relatively small, one-issue activist groups like the Climate Reality Project. They include both organizations that carry on a diverse set of activities and programs, such as Ducks Unlimited, and those with a single-issue or more regional focus such as Wildsight. Note: There are 34 listings here that incorporate 40 organizations. Some organizations have an advocacy and foundation or charitable arm. These have been combined in the table under one name and notes. 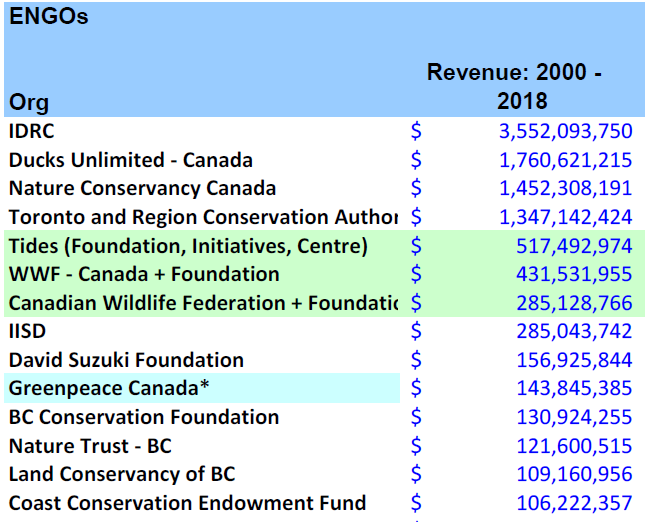 Table 2 is a list of environmental law organizations, again ranked according to the revenues received over the period 2000 to 2018. These organizations are primarily engaged in legal activities that they perceive to further the environmental policy agenda. These can range from lobbying activities to inform and influence the development and passage of legislation to intervening before regulatory bodies and launching lawsuits and court challenges to stop specific projects from proceeding. 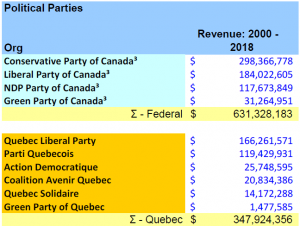 Table 3 is a list of the main political parties at the federal government level in Canada as well as a selective list of political parties at provincial government level, also ranked in order of revenues. Finally, Table 4 is a list of the “think tanks”, or public policy institutes with policy perspectives emphasizing the use of competitive market forces rather than government action to achieve public policy objectives. Their analyses often place them in competition with the more interventionist views of the ENGOs, and sometimes they are considered by ENGOs as adversaries. The top 40 ENGOs received about $11.2 billion over the period 2000 to 2018. 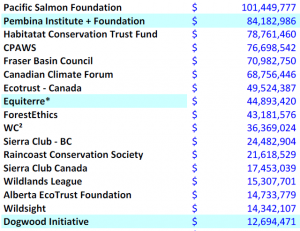 The “EnviroLaw” organizations received about $167 million over that same period. The combined revenues of the ENGOs and their EnviroLaw counterparts was almost $11.4 billion over the period. The total revenues received by all four main federal political parties over the period was about $631 million. The total revenues received by the major political parties at the federal government level and the provinces of Ontario, Quebec, British Columbia and Alberta over the period were $1.5 billion. The total revenues received by the market oriented (“conservative”) institutes over the period was $412 million. The revenues received by the ENGOs and their EnviroLaw counterparts over the period was over 18 times the revenues received by all federal political parties, and over 27 times the revenues received by the market oriented institutes. 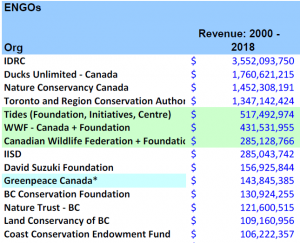 Both Ducks Unlimited Canada and the Nature Conservancy Canada annually receive higher revenues than all the major federal political parties; a large portion of the funding to these organizations is from the federal government. The revenue received by the Tides organization alone is more than the combined revenues of Canada’s two largest federal political parties, the Liberal Party of Canada and the Conservative Party of Canada over the period. 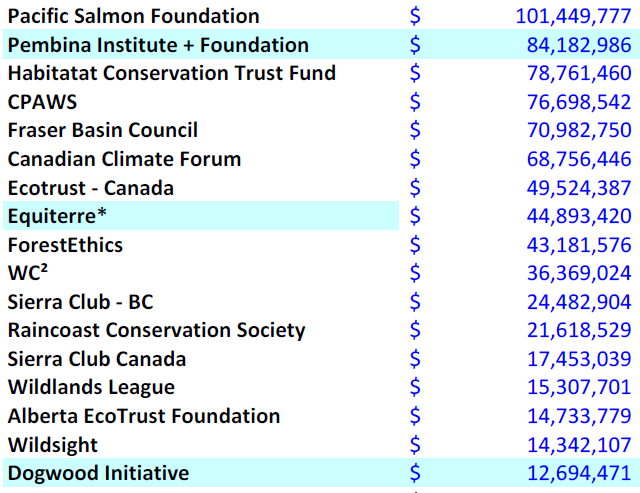 The David Suzuki Foundation’s average annual revenues exceed the annual revenues of the federal New Democratic Party. Eight ENGOs have annual revenues that exceed those of the governing Liberal Party of Canada. Yet, simply by reviewing the funding documented in the CRA files, we are now aware of the surprising concentration of wealth in non-profit, charitable organizations and their ability to influence public-policy in much the same way that we worried about “Big Money”. No one should be under any doubt that, whatever their other purposes and activities, Canadian ENGOs are significant political organizations. They use their large funds to influence public opinion and to lobby federal and provincial governments in ways that support their views, even when those views are directly at odds with the economic interests of certain regions, industries or firms. Money alone gives them clout, and they are not ashamed to use it. They are able to use their funds and influence to shape environmental policy and regulation. This might be entirely acceptable in a democracy, except for a few things. One is that many of these organizations were created by and remain heavily funded by foreign foundations that may not have Canadian interests at heart. At a minimum, Canadians should be able to see which foreign sources are pulling the strings, especially when the competitiveness or market access of Canadian firms is at stake. free from having to pay income tax. The result is what Finance Canada would call a “tax expenditure”, or a draw on the federal treasury caused not by a direct expenditure of funds but by tax treatment that departs from the norm. As that expenditure must be paid for, it is a cross-subsidy from all the other taxpayers of Canada. Some of the ENGOs’ activities appear to conflict with the fundamental purposes of charitable, non-taxable status. For the industries harmed by current climate policies, and especially the hydrocarbons industry of western Canada, subsidizing the adversary must be an especially bitter pill to swallow. Related: Friends of Science Oct. 12, 2018 letter to Finance Minister Morneau on the activities of environmental charities. For Canadian-based non-profit, charitable organizations all revenues are taken from publicly available CRA T-3010s reported in $CDN as reported in the year of filing. For Canadian-based non-profit, charitable organizations that are independently operating of their parent American organizations all revenues are taken from publicly available CRA T-3010s reported in $CDN as reported in the year of filing. For organizations that are dual registered as non-profit, charitable organizations in Canada and the US, all revenues are taken from publicly available CRA T-3010s reported in $CDN as reported in the year of filing. For Canadian-based non-profit organizations all revenues were extracted from publicly available Annual reports issued by the organizations reported in $CDN as reported in the year of filing. For Stand.earth – FNA FOrestEthics – an American based non-profit organization operating in Canada the revenues were taken from IRS 990s reported in $US as reported in the year of filing. For Canadian Federal Political Parties all revenues were obtained Annual Party Financial reports filed with Elections Canada. For Canadian provincial Political Parties all revenues were obtained from Annual Party Financial reports filed with the appropriate Provincial Elections organizations: Elections BC, Elections Alberta, Elections Ontario, and Élections Québec. Where an organization operates more than one registered non-profit, charitable organization, the revenues have been combined as reported in the year of filing. All foundations and charities should be paying taxes, the same as individuals, in my opinion. The only way to control taxation for all, including companies. BAN THEM FROM CANADA ! Treat them like political parties and limit the deduction for donations to $1000. Why should taxpayers subsidize lobbyists most of whom are neither charitable nor science based.